$50 set-up charge includes the same 1-color imprint, same design on all 4 sides. Additional color/design is $.60 each. Please specify side location (1, 2, 3 or 4) for each design. Also specify layout on each side. See page 188 for standard side imprint colors. 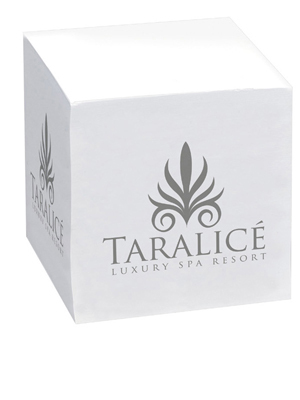 Sheet Imprint 4-Color Process (4CP): $.60 per cube. Includes a 4-color process imprint. Please specify layout. See General Ordering Information tab for standard imprint colors. For art templates,click on templates above. 5 working days. Allow 3 additional working days for sheet imprint.